It's The Only Country Where Undocumented Migrants Have The Same Health Care Rights As Citizens : Goats and Soda Migrants often have trouble getting medical care in the country where they've resettled — especially if they're in the country illegally. But not in Thailand. 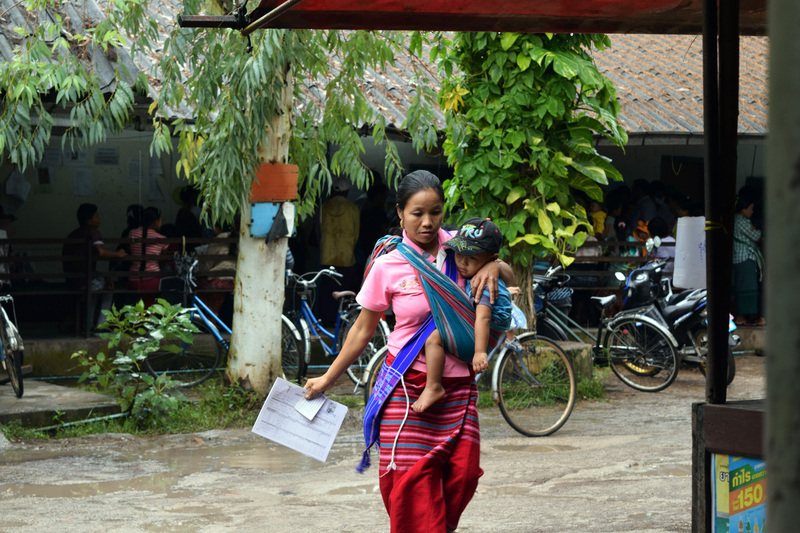 A Myanmarese migrant and her child seek care at a refugee health clinic in Mae Sot, Thailand. Mae Sot, a town along the Thai-Myanmar border, is home to many Myanmarese migrants, some of whom are there illegally. Last year, a record number of migrants and refugees — more than 1 million — crossed into Europe, sparking a crisis as countries struggle to cope with the influx of more and more people. And one element of the crisis is health care. Migrants often have trouble getting medical care in the country in which they resettle. Those who are in the country illegally have an even harder time. While many countries struggle with whether — and how — to provide health care for their migrant populations, one country seems to stand out in its policy to provide equitable coverage for migrants and refugees, regardless of their legal status: Thailand. In Thailand, migrants — who account for more than 6 percent of the country's 67.1 million population — are able to immediately buy and access the country's universal health care. It's the only country in the world where migrants there illegally have the same health care rights as nationals. This policy has been in place since August 2013, when Thailand's Ministry of Public Health extended the country's extant universal health care policy — which has been in place for Thai nationals since 2002 — to include migrants. "Most countries have existing mechanisms for providing universal health coverage for their citizens, but this may not necessarily mean extending coverage to migrants, mobile populations, and other vulnerable groups in their countries," says Nenette Motus, the health adviser for the International Office of Migration in Asia and the Pacific. "Migrants and marginalized populations, too, have the right to health care and must have access to equitable health care coverage. Thailand, in particular, has health insurance schemes for both documented and undocumented migrants." This plan also includes medicine to manage chronic illnesses such as HIV, which is critical for patients who need constant and consistent treatment with antiretrovirals. A combination of factors led the Thai government to contemplate a system that gave migrants equal health care. By 2005, migrant workers from Myanmar, Laos and Cambodia accounted for 5 percent of all labor forces within Thailand, according to the International Labour Organization. The government recognized the migrants' contribution to the economy, considered access to health care a human right and was concerned that the lack of proper care for this vulnerable population would allow for communicable diseases that had already been controlled in Thailand to spread once again. According to the UNAIDS 2014 Gap Report, HIV prevalence among migrants to Thailand from neighboring countries is up to four times the rate of HIV prevalence found among the general Thai population. Migrants in Thailand are also more likely to suffer from and seek treatment for communicable diseases like tuberculosis, syphilis, leprosy, malaria and elephantiasis. In the decade leading up to the change in policy, many organizations had already set up health projects in migrant-heavy communities in Thailand. So when the policy expanded, "there was no big controversy among health care officials whether or not to provide basic health care and life-threatening treatment to migrants, regardless of their legal status," says Aree Moungsookjareoun, the border and migrant health officer at the World Health Organization in Thailand. "It's really amazing what Thailand did," says Tatiana Shoumilina, the UNAIDS representative for Thailand. "They said any migrant — documented or undocumented, legal or illegal — can buy a health insurance card." Initially, migrants would pay 2,800 THB (about $78) for an annual health insurance card. After the program successfully enrolled its starting target of 300,000 migrant subscribers, the yearly premium dropped to 2,100 THB ($58). Today, more than 1.3 million migrants — approximately a third of Thailand's migrant population — are enrolled in the health care system, according to the Ministry of Public Health. The majority live in Bangkok and adjacent provinces, where thriving fishing and construction industries depend on migrant labor. But the two-year-old policy has some gaps in the coverage it provides. In certain areas — such as Mae Sot, a town in Thailand adjacent to Myanmar with a large population of Myanmarese migrants — those who are there illegally still have trouble buying health care without the proper paperwork. For instance, hospitals can turn migrants away if they are not healthy, which could mean high costs for treating the patients. And some hospitals in more remote regions lack the medical and financial resources to provide adequate care. Although Mae Sot is home to many Myanmarese migrants, "it's still in a very remote place, which makes it hard to send supplies and medicines from Bangkok," says Pornpet Panjapiyakul, the director of Thailand's Bureau of Health Administration. Mae Sot Hospital has paid more than $1.6 million out of pocket to provide care for Myanmarese migrants. "In reality, many hospitals refuse to sell migrants health care because taking care of all these sick migrant workers could make the hospitals go bankrupt," says Chatwut Wangon, Thailand's program manager of AIDS Healthcare Foundation, an international nonprofit that provides resources for people living with HIV/AIDS. But Thailand's policy is still far more generous than other countries that are now home to growing migrant populations. While the 28 countries of the European Union provide universal health coverage for nationals, few offer migrants equal coverage. In Germany or Sweden, for instance, migrants in the country illegally can only access emergency services. "No EU country has exactly Thailand's policy of full access to all services on equal basis as citizens on payment of fee," says Lilana Keith, the program officer at the Platform for International Cooperation on Undocumented Migrants, a nonprofit that helps provide health care and other services to migrants in the country illegally. A few countries, like France and Portugal, do provide equal access for migrants there illegally — though only if they have resided in the state for more than three months. Only 10 countries (a little more than a third) in the EU allow such migrants to get treated for HIV; indeed, many countries already have reduced spending for public health programs for nationals. In Portugal, Italy and the U.K., however, migrants there illegally can procure antiretroviral medications even when they do not have the same health care rights as nationals. Meanwhile, Thailand is trying to improve its system. The Ministry of Public Health, the Cabinet and nonprofit groups are working together to find ways to better implement the migrant health care policy, but time is running out. The Global Fund, an international foundation that supplies medicines for HIV, tuberculosis and malaria, allocates its resources based on the income of countries in need — and now that Thailand is considered to be an upper-middle-income country, the Global Fund will phase out the country's support by January 2017. To date, the Global Fund has helped more than 2,500 migrants receive treatment for HIV/AIDS in Thailand. In other words, Thailand has less than a year to find and secure domestic funds for not only those who are currently covered by the Global Fund but also the many other migrants who have yet to receive treatment for HIV/AIDS. In the coming months, the Ministry of Public Health plans to work with the Cabinet to develop funding models to ensure a smooth transition. "One of the biggest problems we are trying to solve is how to get the government to reimburse the hospitals," says Surasak Thanaisawanyangkoon, chief of the AIDS, TB and Sexually Transmitted Infection bureau within Thailand's Ministry of Public Health. Some hospitals currently have to wait three to four months before they are reimbursed for their migrant-related expenditures by the government, according to Wangon of the AIDS Healthcare Foundation. Others are not reimbursed in full if they provide costly care for sick migrants in the country illegally who have an insurance card. "It's always a challenge to get undocumented migrants health care, but we intend on keeping the policy," Thanaisawanyangkoon says. And the millions of migrants in Thailand already on the health care plan are grateful. Minh Tun, a Myanmarese migrant, and his wife learned they were HIV-positive more than 15 years ago when his wife had her prenatal checkup. They then moved from Myanmar to Mae Sot for easier access to treatment. Minh Tun currently receives his supply of ARVs from the Global Fund at Mae Sot Hospital. "What am I most scared of? Being cut off from treatment," he says.